Panasonic and Sanyo today announced the launch of the EVERLEDS Lithium-ion Solar Street Light, a solar street light with a refined design combining solar cells and lithium-ion batteries. The EVERLEDS Lithium-ion Solar Street Light is equipped with Sanyo’s HIT solar cells, single crystal hybrid type solar cells with the highest-class conversion efficiency in the world and a thin integrated solar cells and storage unit using Sanyo’s lithium-ion batteries. In the product, electricity is generated from solar energy by the high efficiency solar cells and stored in the lithium-ion batteries attached to the back of the panel. This can then be used to power the high efficiency LED lights for approximately 15 hours during the night. Unlike previous models which required separately installed large lead batteries, the Lithium-ion Solar Street Light is small and refined, and the lead-free design reduces its impact on the environment. 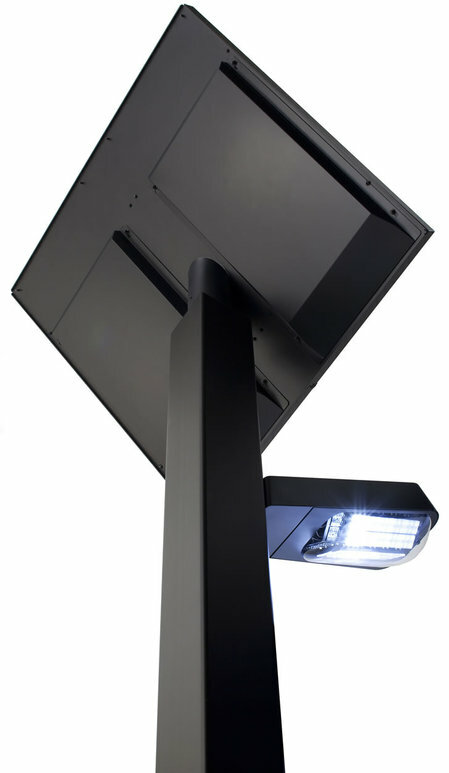 The Lithium-ion Solar Street Light is suitable for use in schools, parks, streets, around housing complex and public outdoor facilities, and in times of disaster will watch over the neighborhood.Two versions of the street light will be released by Panasonic Electric Works in January 2011 in Japan (planned).